The weather report indicates that we are to get 8-12 inches of snow. Hard to believe since it got up to 40 degrees yesterday. 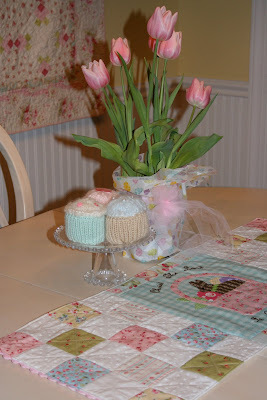 I thought I would take time from my other quilting and make a little Easter table runner. I haven't done much applique and so I'm learning something new. I adapted some patterns that I had and added the words from a familiar hymn. We are all our own worst critics and I see some things that I would for sure change if I did another one. But for the most part I am pleased with how it turned out. Today, when it's howling and snowing outside I can be reminded that Spring is on it's way, even if it has taken a detour and left us some snow in it's wake. Oh the wonder of Renee's never ending talent! Everything that you create is so beautiful!!! Are you having a fun Snow Day? Oh how adorable! You did a beautiful job. I ♥ your table runner. Great job. Isn't applique fun? A little daunting at first, but fun. 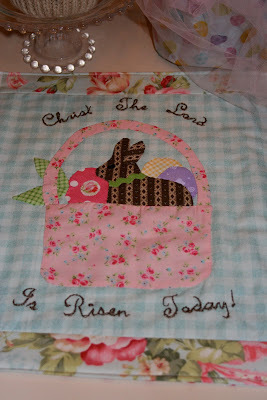 I really love a demo that is over at the Jillilystudio.com website on applique. She makes it so easy (she's a local Utah designer.) It's under the appli-glue video. Anyways, your table setting in the picture above is beautiful too! You did a great job. Cute table runner. Your table looks ready for Easter. I need to get Valentines put away and start getting ready for Spring. Maybe if I start inside, outside will follow. Love the fabrics you used so "cottagey"(? )You know what I mean. Nice! And the little cupcake stand is darling, too. I'm hoping spring comes to you soon. I'm really itching for some green....even dandelions would be fine!